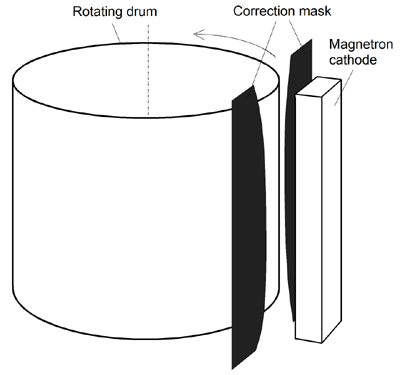 The combination of a rotary drum and an elongated magnetron cathode is seen in many coaters and for various applications. 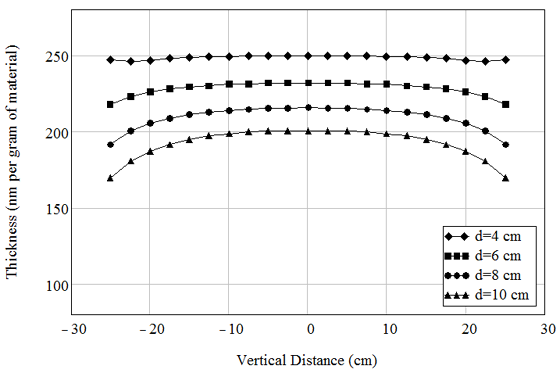 In this example we examine the thickness distribution on the drum surface under varied surface-target distances, with and without correction masks. Varying the distance between the drum surface and the target, d, we obtain a series of thickness plots along the length of the drum. All the thickness values are in units of "nm per gram of material sputtered." The farther the target is from the drum the more significantly the thickness rolls off near the edges. When the target is very close to the drum surface (d = 4cm), the thickness near the edges bend upwards because of the localized contribution of the "U" shaped ends of the racetrack. To improve the thickness uniformity on the drum, we can install a correction mask. With V-Grade 5S we can conveniently select the negative-mask option (Polarity = -1) for fitting a mask which lets through the material vapor in a designed area and blocks the vapor elsewhere. Suppose that we set the target 6 cm off the drum surface, and that we ignore the edges of the drum by using only the centered 45 cm of the length. 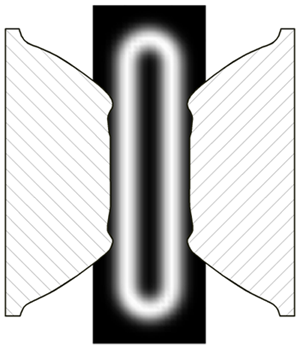 Employing a combination of manual fitting via virtual experiments and the automated optimization routine we obtain a mask design shown in the figure below, superimposed on the target for size reference. The thickness distributions with and without the mask are compared in the second figure below. 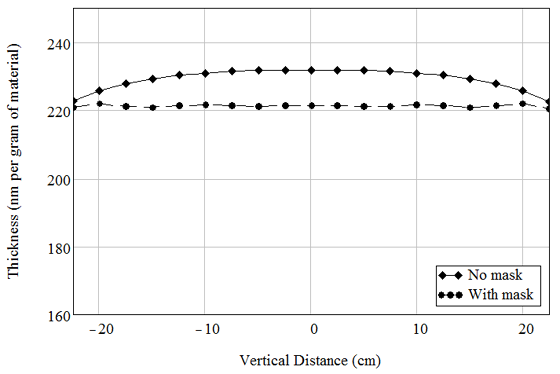 Without mask, the thickness uniformity is 2.0%; with mask the uniformity is 0.28%.